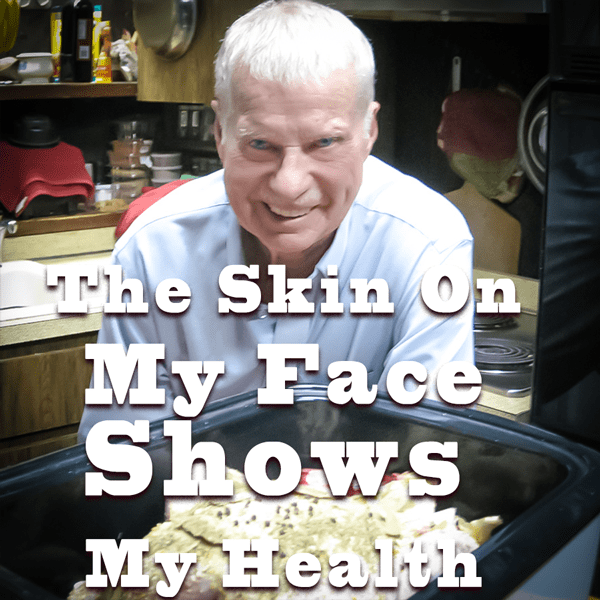 The skin of my face shows my health. The face of a person reveals things about their health conditions. Let’s talk about clean, healthy skin to show a healthy mind and body. My blood steam shoves out millions of dead white corpuscles each day. These need to be removed and the skin wants to be gently massaged. The skin is the bodies largest organ and it constantly disposes of “junk” the inner body wants to get rid of. My bare face is exposed to the harsh sun, the freezing wind, and a constant bombardment of germs, toxins, even flea-dust from dogs, and perfume-chemicals from my fellow travelers. The junk my body spits out through my pores protects my face, and helps keep harmful things from entering. This thick “goo” is a greasy by-product of a healthy body. This messy substance is deposited on and around my nose and all over my face. The skin of my face shows my health but it needs maintenance. Common soap is all I use each day–morning and evening, to remove the daily deposit–that is on my face. Some, of course, comes from inside, and some come from the environment. Just plain old tap water is all we need. If it is good enough to bathe my wife’s cat in, it is all I need for my ancient hide (I am 82-years old.) I remember reading about a man, two thousand years ago, who washed his hands in a mud puddle. Use coconut oil only, on your face. Coconut oil is a natural antiviral–it works. It helps get rid of the bacteria that infect the damaged pores. Drink lots of plain water, it keeps the pores open. For a healthy skin, “Leave the skin alone.” Let go of unnecessary stresses! Let go of your perceived problems. Eat decent, plain foods. Clean your face daily, drink lots of water (This does not include coffee, tea, pop, juices … the list goes on and on.). Massage with your hands and fingers. Dry the skin and massage coconut oil into the dry skin.